The World Guide to Sustainable Enterprise is the first comprehensive global compendium that clearly describes the national approaches to sustainable enterprise. Through a systematic review of each country, this quick-to-access reference guide showcases the similarities and differences in each region. Every country profile includes key information about the relevant history, country-specific issues, trends, research, and the leading organizations operating in the field as well as best-practice case studies. The guide comprises four volumes, each dedicated to a specific region of the world. In a world where organizations are working increasingly across national and regional boundaries and research takes a joined-up and international approach, this book is an essential guide for practitioners and researchers in the disciplines of business sustainability, social enterprise and corporate responsibility. The first of its kind, this reference book provides the reader with a unique insight into what is the current state-of-play in each country. Each edited volume provides expert contributions from around the world; the contributors have been selected on the basis of their knowledge of the country and their clear experience in sustainable enterprise. Each regional/country profile includes the following subsections: Sustainable Enterprise in context; Priority issues; Trends; Government policies; Case studies; Further resources; and References. This unique resource will be an essential acquisition for all organizations who need to benchmark their sustainable enterprise strategies throughout different regions and cultures and want the best possible intelligence on the key issues and concerns relating to sustainable business and social responsibility in all of the markets in which they operate. It provides a useful companion reference collection to the World Guide to CSR, also edited by Wayne Visser. 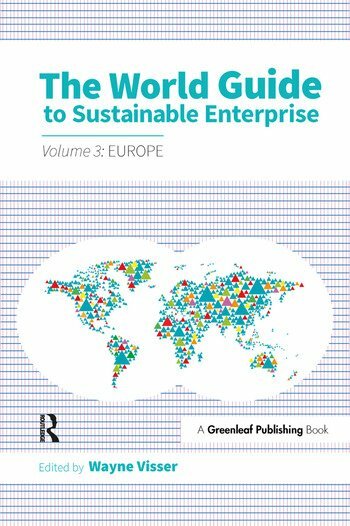 The full Four Volume Set of The World Guide to Sustainable Enterprise is available for purchase as a single item at a 25% discounted rate.